Live animals are being transported from the UK abroad to be slaughtered or for further fattening. Such journeys can last over eight hours, and involve animals being kept in uncomfortable conditions. Animals are subject to overcrowding, dehydration, pain and stress. Sheep and cattle are exported for slaughter, including very young dairy calves who have been taken away from their mother to be slaughtered for veal. In 2012, the charity Compassion in World Farming (CIWF) followed a lorry carrying 166 calves from the UK to Spain. During this time, they found that the calves were trying to suckle from each other (indicating just how young they were), and they saw a calf being yanked by its tail whilst they were being unloaded. CIWF calculated that these calves had travelled over 1,100 miles in just under 60 hours . This is not an unusual length of time for animals to travel to slaughter, with information from the UK government showing that calves have had to endure journeys of over 91 hours. 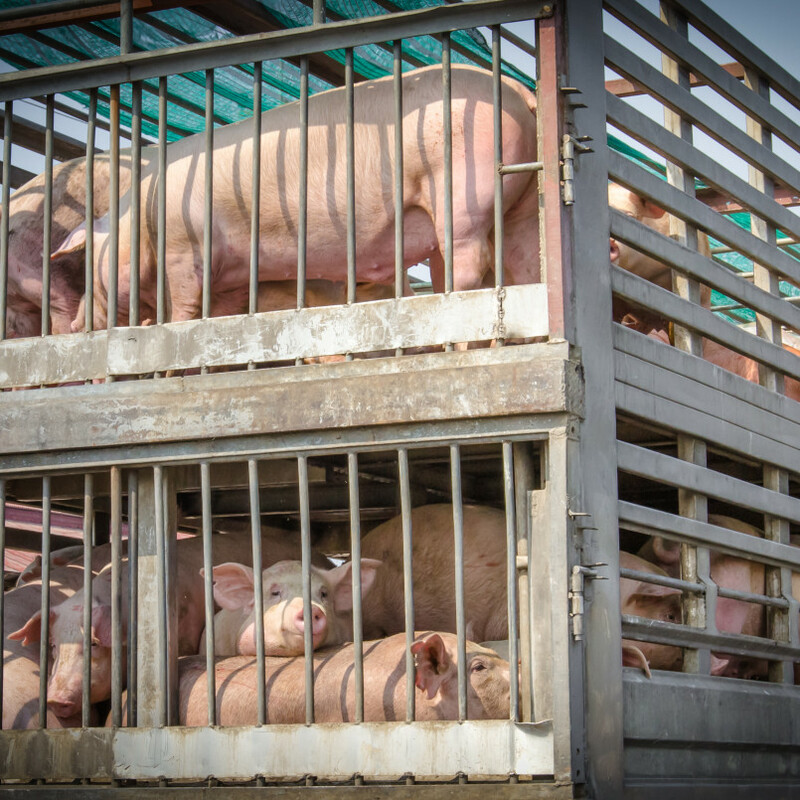 Scientific research highlights the stress that live transport can cause animals. For example, it has been shown that pigs cannot sweat effectively, meaning that they can be prone to serious heat stress during transport, as well as experiencing severe motion sickness [2,3]. Another example is that, a 2007 review concluded that “young calves are not well adapted to cope with live transport”. This is largely because, at such a young age, their immune systems are not fully developed, and they are not yet able to control their body temperature . In Scotland, the numbers of animals that are exported is not known, although it is known that they have been exported to Ireland, through France and to Spain. Animals also may have to endure journeys within Scotland, with animals being exported from the Scottish islands to the mainland to be slaughtered. There are also issues when animals arrive at their destination. Often animals that are exported end up in slaughterhouses that do not have as strict a policy on animal welfare as in the UK. For example, video evidence has been shown that animals slaughtered in Turkey and Jordan were dragged by the tail, legs, fleece and even their eye sockets. Furthermore, slaughter practises that are banned in the UK are still used elsewhere. For example, in the Middle East, animals are often not killed by one cut, but are subjected to many agonising stabs, resulting in a slow death . OneKind wants to see the live exportation of animals banned in the EU. We believe that, if animals are to be slaughtered, they should be done so closer to home. In the mean-time, OneKind is calling on the government to introduce a maximum transportation time of live animals of eight hours. Furthermore, before an outright ban, OneKind urges the government to ban the exportation of live animals to countries where there have been frequent and serious breaches of animal welfare standards.